Breadfruit in haitian is called Lam veritab, bread fruit is a multipurpose tree crop that is primarily used for its nutritious, starchy fruit. 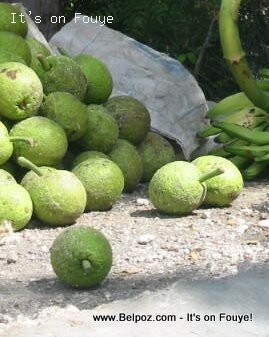 Haitian Breadfruit or Lam veritab is becoming an export crop in the Caribbean. Breadfruit is a staple food in many tropical regions. They were propagated far outside their native range by Polynesian voyagers who transported root cuttings and air-layered plants over long ocean distances. Breadfruit is very rich in starch, and before being eaten it is roasted, baked, fried, or boiled. When cooked the taste is described as potato-like, or similar to fresh baked bread (hence the name).